Description: Injured and on the run, it has been seven days since June and Day barely escaped Los Angeles and the Republic with their lives. Day is believed dead having lost his own brother to an execution squad who thought they were assassinating him. June is now the Republic's most wanted traitor. Desperate for help, they turn to the Patriots - a vigilante rebel group sworn to bring down the Republic. But can they trust them or have they unwittingly become pawns in the most terrifying of political games? 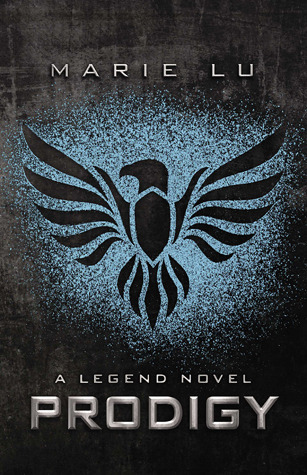 My Review: Prodigy starts out right where Legend left off. It seems that a lot of the trilogies that I read have that middle book syndrome, where the second book just bridges a great start and an okay ending. This one was NOT what I was expecting--it was still action-packed, with romance, adventure, and secrets unveiled...and I enjoyed it. A lot. I loved getting to know some of the characters better and understanding the different groups--the Republic, the Colonies, and the Patriots. Kaede is a character that I was on the fence about in Book 1: do I like her or not? Tess is another character who had motives revealed. The characters who I enjoyed discovering the most were June and Day. There are so many facets to their personalities and to what makes them tick. Things were not always what they seemed to be. I don't know how Day and June could decide where to place their trust. I always put myself in the story and there's no way I could be as brave, resourceful, and smart as these two are. I'm always good for a love triangle and there were a couple of intertwining triangles going on here. I'm glad that I have the next book on hand--I'm dying to know how this will all end, especially with all that happened in the last few pages. Content: PG-13 violence; kissing, including a bathtub scene (it didn't cross that line); some language.